org2blog is a beautiful plugin to post to wordpress blog. I won't waste your time on the basic usage because it has zero learning curve and its README is very clear. I will talk some advanced set up here. As a programmer, I need wordpress syntax highlight all the code snippets I post. But it seems org2blog need some tweak to support language like elisp. If you grep org2blog's code, you will find a variable "org2blog/wp-sourcecode-langs". It lists all the languages org2blog supports. Then you need install the wordpress plugin SyntaxHighlighter Evolved to do the syntax highlight thing. Well, you will find the languages like elisp is not supported by this plugin. As you can see, I use clojure syntax to highlight elisp and use ruby syntax to highlight lua. You may ask why I use clojure syntax to highlight simple text in above set up? Well, I already submit lots of my elisp code before set up my org2blog correctly. Those code snippets are regarded as simple text. I won't waste my time to mark those old snippets one by one. That's why I render text as clojure code. Besides, I find the wordpress theme produced by Automattic (Yes, the company behind wordpress) is good for programmers because they obviously have optimized font size for different screen resolutions. That's important for code reading. I use Trvl v1.0.2. I write some set up code in ~/.custom.el. It will detect which machine and what directory I'm working on. Then I hook the set up code when major mode (js2-mode, web-mode, for example) loaded. This is original link of the question. Please note I focus on programming for large projects. I need search/grep/modify files scattered in different places without documentation. ido-find-file (emacs), just type any characters, it will fuzz search matched file in parent/sibling/current/or-whatever directory. recentf and helm (emacs), I use regular expression open recent opened files. I also use lots of bash functions written by myself, those functions are trivial, but combined with a wonderful tool called percol, they become really powerful. I use some CLI clipboard tool so I can easily share the file path between terminal/emacs/firefox. there is also a emacs bundled feature called speedbar, which is similar to the file explorer, I used it once, but it does not fit in my ninja style ;) It's fine but the UI is almost same to those average text editors. there is also some git based emacs plugin: you can search file under the project root directory. there is a CLI tool called fasd which can let you interactively select the file or folder you recently visited. "gef keyword *". gef is my bash function based on grep. the full path is in clipboard now, then I type ":e Shift-insert" to open that file. This is the most difficult case, I usually strike less keys and not get out of Emacs. If i need insert this file's relative path, I press a hot key and another emacs plugin will correctly convert absolute path to relative one (relative to the file I'm editing in Emacs) and insert it into my editor. Here is screen cast. In this demo I grepped and open a ftl file and then search another js file in the same project. For example, after installing the lisp code. You can M-x find-function package-list-packages in Emacs, you will jump to the definition of that command in "/usr/share/emacs/24.3/lisp/emacs-lisp/package.el" (I assume your emacs version is 24.3). "add current directory into load-path, useful for elisp developers"
Jeff Weinstein programmer at Netscape.并不是Netscape最优秀的员工.嘿嘿. I love the REPL (Read–eval–print loop). Watch live update of web page when typing code is cool. But most solutions around the internet are not practical for me. In my world, I never has a chance to develop fancy 2D/3D games written in HTML5 canvas. Instead, I was ALWAYS assigned to maintain some enterprise CMS with complex business logic. For example, after refreshing the web page I need click lots of buttons before doing the job. Avoiding press "refresh page button" does not help much. no learning curve. I don't want to learn any domain specific language or API. For example, if my web application uses jquery, I want use and only use jquery API to manipulate web page in my text editor. If it use backbone, then I use backbone. No more, no less. The best solution is firefox addon MozRepl. You can install it https://addons.mozilla.org. 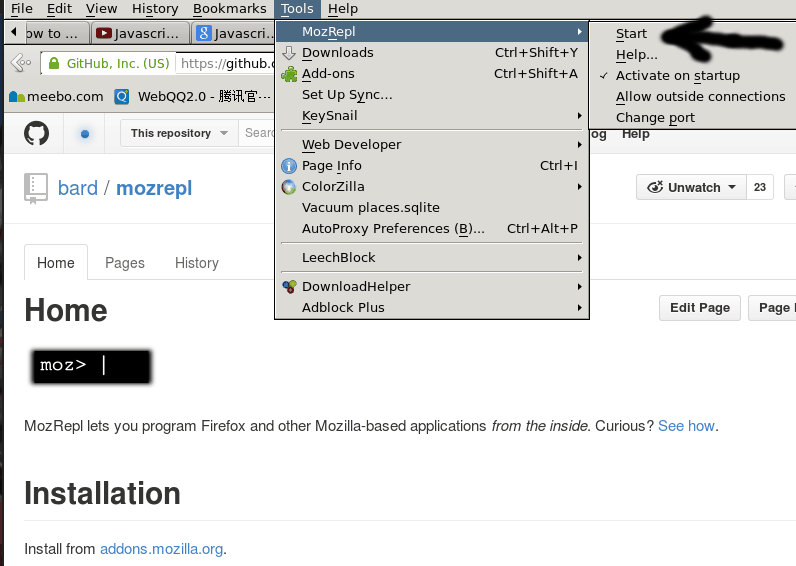 Click firefox menu "Tools => MozRepl => Start" to run it. So what is MozRepl, as its web site says, "MozRepl lets you program Firefox and other Mozilla-based applications from the inside." Basically it convert firefox into a socket server. Your text editor could talk to firefox and let firefox do anything you want. Since it only interact with the firefox, I don't need mess with the web server. Well, I hope I can end this article by claiming "after reading its official tutorial,I live happily with MozRepl ever after". The ugly truth is, MozRepl has some rough edges. That's the reason why I write this article. I will explain how to use MozRepl in next two sections. Section 1 is about how to use MozRepl, whatever text editor you use, you should read this section. Section 2 is on how to set up my text editor Emacs to interact with MozRepl. It's optional. There is video demo on youtube. I suggest watching from 2:18 because you possibly are more interested in manipulating web page than toy with firefox internals. For some weird reason, MozRepl socket server needs some warm up after web page refreshed. So run the code like "console.log('hello');" in the first connection, close the connection, and run your other code in second connection. Please note the code is not part of my web application! It will be run only in MozRepl. You can telnet to the MozRepl socket server (127.0.0.1 with port 4424) and copy paste above code line by line. My text editor is Emacs, so I use Emacs as an example. Step 1, install moz.el according to official manual. "load js file from specific directory and send it to mozrepl"
From now on, you only need "M-x moz-load-js-file-and-send-it" and select the js file you need MozRepl to run. Well, this is a simple tip. Maybe you are already aware of this. You can write a all-in-one.js. In all-in-one.js, you can parse the URL to separate logic for different project. Sometimes mozrepl will be unresponsive. You can test it by running "M-x moz-reload-browser" to refresh the page. If page is not refreshed, restart Firefox. Luckily this does not happen too often. Here is a demo how I use it in a real world web application development.